What does any of this have to do with selfie sticks? Well, I think of “selfie sticks” as “iPad/iPhone-ography 2.0” Now, you have a tablet device or phone AND a stick acting as a mono-pod blocking the view of other guests. 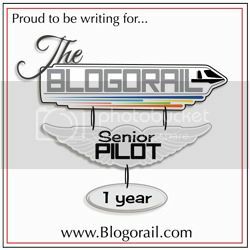 Now let’s think about this when it comes to a more thrilling attraction like Big Thunder Mountain Railroad or Rock n’ Rollin Coaster. 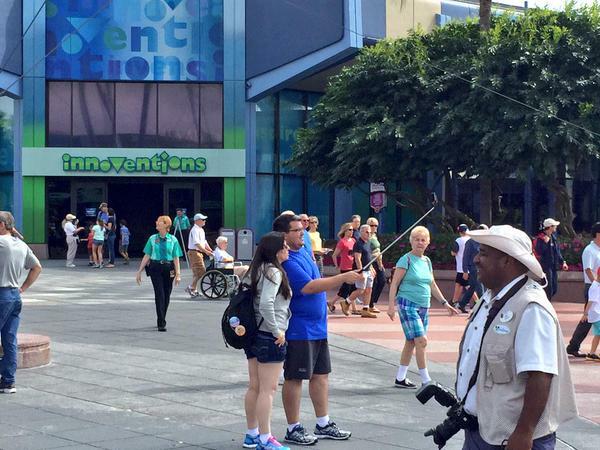 What if someone attempts to use a selfie stick on this type of attraction? The Cast Member should be on the lookout for these devices and informing guests that they are not permitted on the attraction. In these cases, the guest is putting not themselves at risk but putting other guests at risk as well. What happens if the guest holding the selfie stick loses his/her grip or the phone falls out of the stick and goes flying back into the trailing cars. It could seriously injure someone. The injured party isn’t going to sue the guest who was holding the stick. They are going to go after Disney because Disney has deeper pockets. This couple, here, isn’t harming anyone or getting in anybody’s way. 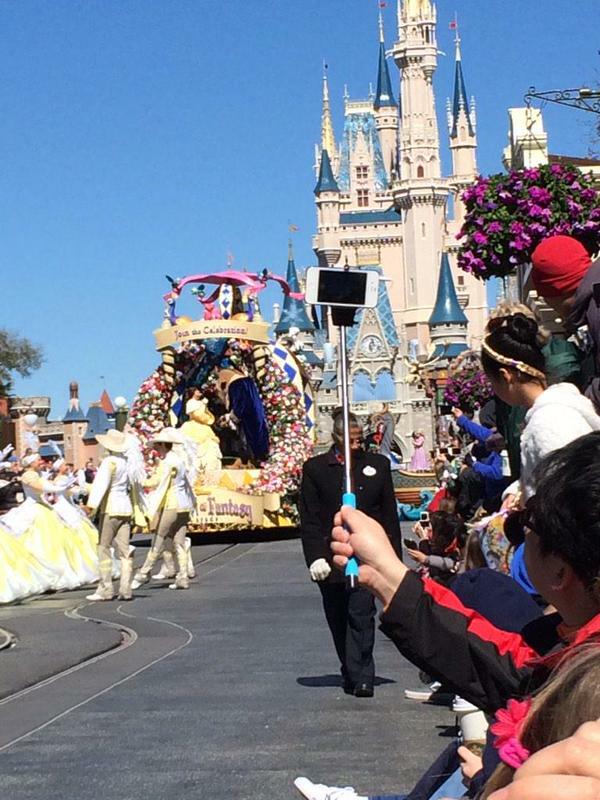 But Disney could have a problem with the selfie stick in this case. They are steps away from a Disney Photopass employee. Disney, from a business standpoint, want guests to have their photo taken by Disney Photopass employee and sign up for Disney’s Memory Maker. However, using a selfie stick is really no different from asking a passer-by to take their picture with the device. The photo subjects by using a selfie stick are not unknowingly exposing themselves to disease (measles outbreak at Disneyland for example). So, in this case, it may be acceptable to use the selfie stick. Here’s a classic example of what I was talking about at the beginning of the article. Not only did this guest get in place early enough to be in the front row, then they have to block everyone’s view with their phone on a selfie stick. Is this really necessary? Why can’t the person just enjoy their front row seat the parade? This can lead to conflicts between the person using the selfie stick and the people behind them. It only takes the right mix of personalities to have a small conflict lead to something more contentious. Is this something Disney really wants? Do they want the surrounding guests and cast members in the parade distracted by the conflict or do they want people to enjoy the parade? I would think that they want people to enjoy the parade. On the whole, the selfie stick does have some positives. However, I think because of the potential liability of a guest using a selfie stick on an attraction that Disney World and Disneyland will have to make a move to ban selfie sticks from the parks. The chance of someone getting hurt because of a selfie stick or a phone/tablet that comes dislodged from a selfie stick is just too great. When a person’s actions has the possibility to hurt others, something has to be done to prevent that possibility from occurring. 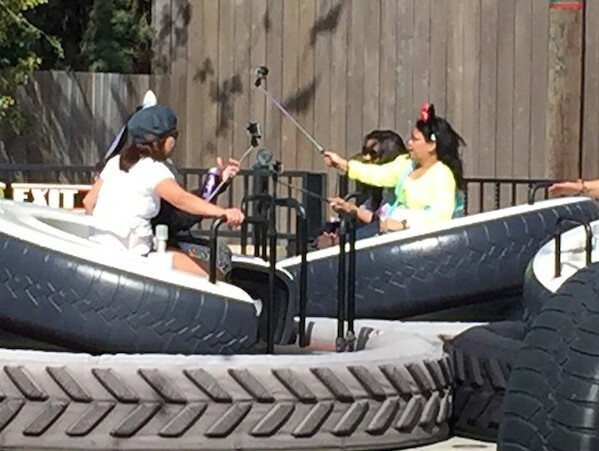 What are your thoughts on the selfie sticks and Disney parks?